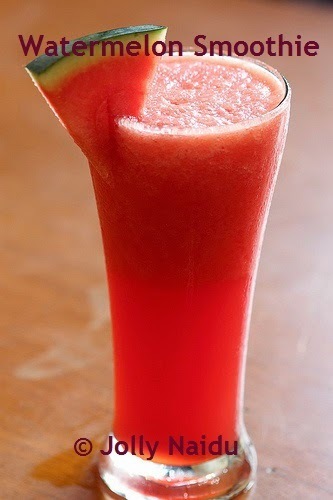 Beat the heat with cool & refreshing drink "Watermelon Smoothie". This drink gives you freshness and makes your day perfect. :) :) . This is really delicious drink. This is one of my favorite drink because it is easy and take very less time to make. This is the best meal for breakfast either you have it on morning or evening time. Refreshing and cool watermelon juice with a splash of lime is the perfect drink to enjoy on a hot summer day. It is so simple to make. Watermelon is the perfect fruit for summer to beat the heat. This smoothie is sweet and tangy in taste. Watermelon juice is healthy drink as it cools the stomach. 1. For preparing watermelon juice, squeeze out of the juice of the lemons and keep it aside. 2. Blend watermelon, lemon juice, sugar and crushed ice. Mix well. 3. Refreshing watermelon smoothie is ready. Serve with crushed ice / ice cubes, Garnish it with melon slice.